Sometimes I catch Sam staring lovingly at things—old cameras, kittens, sour beers, our infant daughter. Yesterday I caught him with his head in the fridge, staring lovingly at a jar full of wet, fermenting raisins. "Aren't they wonderful?" he sighed. Of late, Sam has discovered a desire to 'master' fermentation in all its forms. He bought a book called Mastering Fermentation. And now we have a lot of things in jars. Apart from the raisins, which are slowly pickling and will someday become chutney, Sam is trying his hand at fermenting his own vinegar. According to the book, all it takes is the core and skin from a whole pineapple, 2 litres of water, half a cup of sugar, and patience. The byproduct of the vinegar was fresh pineapple, so this tropical birchermüesli was born. It uses coconut milk, toasted coconut and dried pineapple, though you could use any dried tropical fruit. The most important thing is to only add the pineapple at the end—if you let it sit in the yogurt it gives it a funny, curdled taste. You can really easily make this dairy-free by using a non-dairy yogurt. For more on Birchermüesli, check out my posts on classic Birchermüesli, the original: Dr Bircher's Müesli, and its inventor, Dr Bircher-Benner. I'll let you know how the pineapple vinegar turns out. In six weeks. Sam says: sauerkraut, you're next. Weigh out your coconut (also any coconut you will use for garnish) and oats in separate small bowls. Heat a frying pan on medium high heat. 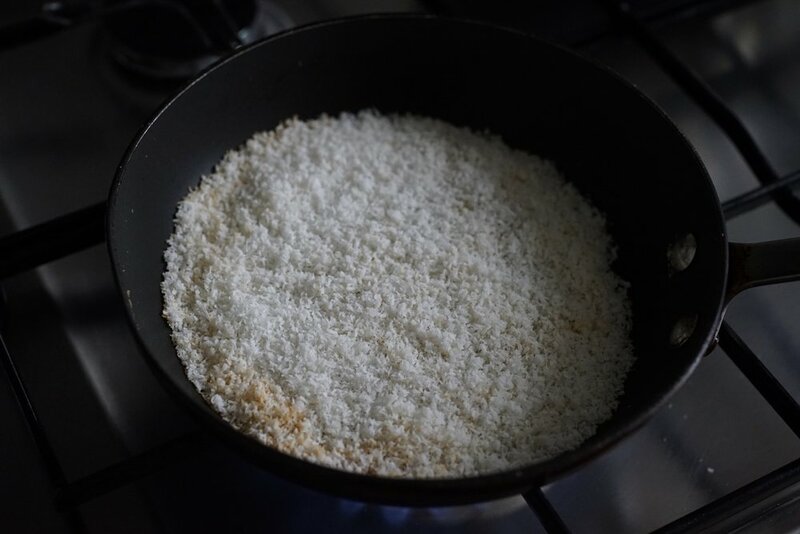 Toast each separately—first the shredded coconut, for about 5-7 minutes, stirring often, until it turns golden brown. Put this in a medium sized bowl. 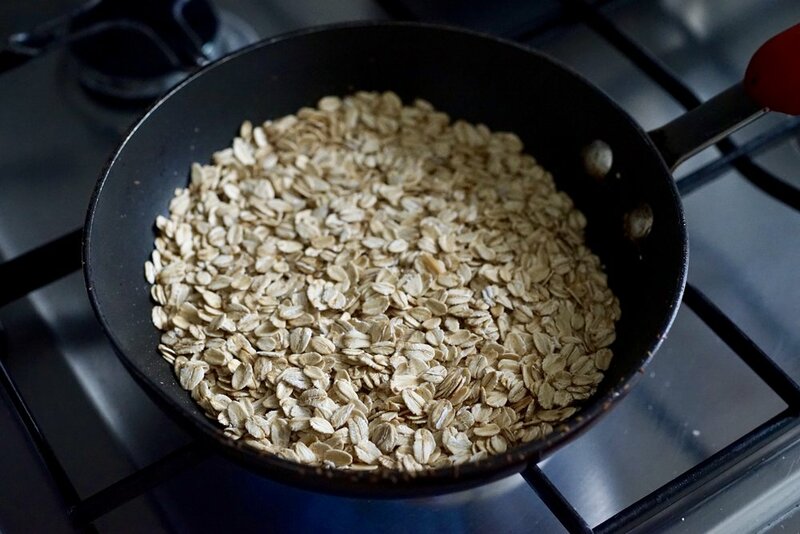 Then toast your oats, adding them to the bowl. Finally, toast your coconut garnish, and put it aside. Add the dried pineapple, coconut milk, yogurt, and sugar to the oats and stir well. Cover and refrigerate for a few hours or overnight. Before serving, give the mixture a good stir. If it is very dry, add some more milk until it reaches your desired consistency. Top with fresh pineapple and toasted coconut. If you don't have brown sugar, you can use white sugar, or any other sweetening agent—maple syrup, honey etc. 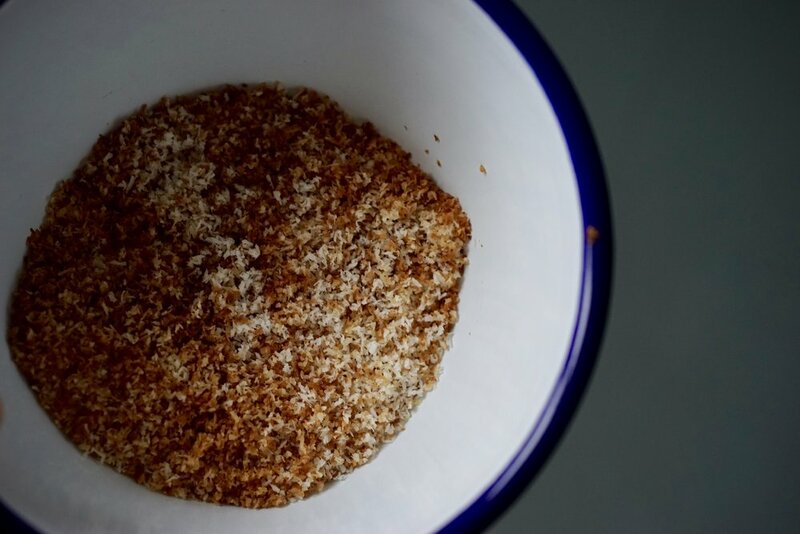 The amount of sugar can vary based on how sweet you like your birchermüesli, as well as whether your coconut is sweetened or not. Add a little at a time, tasting as you go. Some people prefer a thicker mixture, while others like it runny. Before serving, loosen it with some more milk (coconut or regular), or even coconut water, to make it your desired consistency. Add the fresh pineapple right before serving, otherwise it adds an unpleasant taste. If you don't have fresh pineapple, use canned. Or another tropical fruit—mango? Papaya?